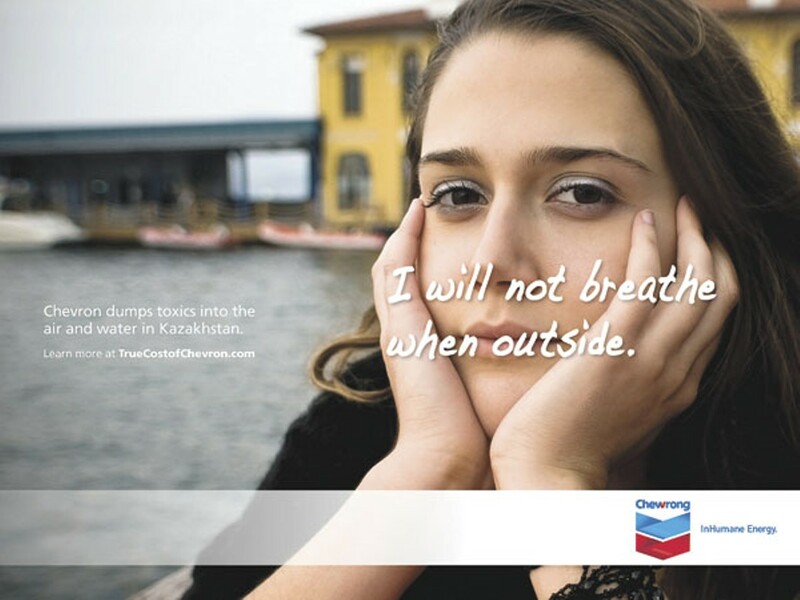 The activist groups are satirizing Chevron's "Human Energy" ad campaign with their own campaign, dubbed "Inhumane Energy." The oil industry is more powerful today than at any other time in history save the early 20th century. Thanks to last year's record run-up in oil prices, seven of the world's most valuable corporations are now oil companies. Yet just one of those companies has become the focus of intense consumer ire. Perhaps the largest coordinated activist campaign in history is being launched against the San Ramon-based Chevron Corporation. Foregoing boycotts and other traditional market campaign techniques, non-governmental organizations are creatively communicating the business case for why Chevron should change its ways, focusing on mobilizing company shareholders and consumers to compel the company to come clean and pursue social and environmental leadership. This unprecedented campaign to make Chevron the poster child of corporate irresponsibility has already persuaded pension funds in California, Maryland, New York, and Pennsylvania to consider selling a total of $12 billion in Chevron shares on the grounds that the firm is mismanaging its operations around the globe. 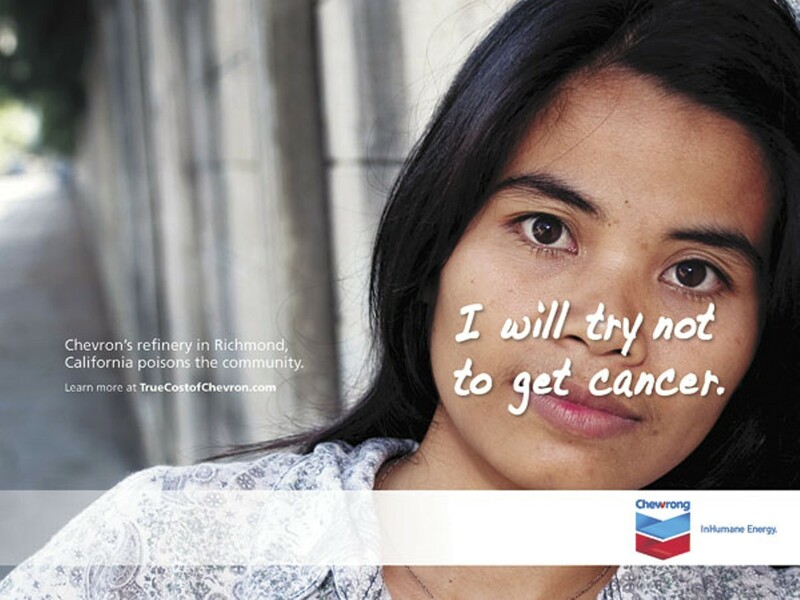 The prime focus of this ongoing anti-Chevron effort has been the company's annual shareholder meetings, but protests at the Richmond refinery and a series of movie and PR stunts have been also been effective tactics. The brains behind the campaign is a small firecracker of a woman, Antonia Juhasz, director of a special new Chevron program for Global Exchange, the San Francisco activist organization. Author of the book entitled The Tyranny of Oil, Juhasz brings to the campaign a depth of knowledge about the oil industry and a penchant for understanding how the media works. It was her idea, for example, to create an alternative shareholder report — The True Cost of Chevron — released in time for Chevron's annual shareholder meeting this past spring. 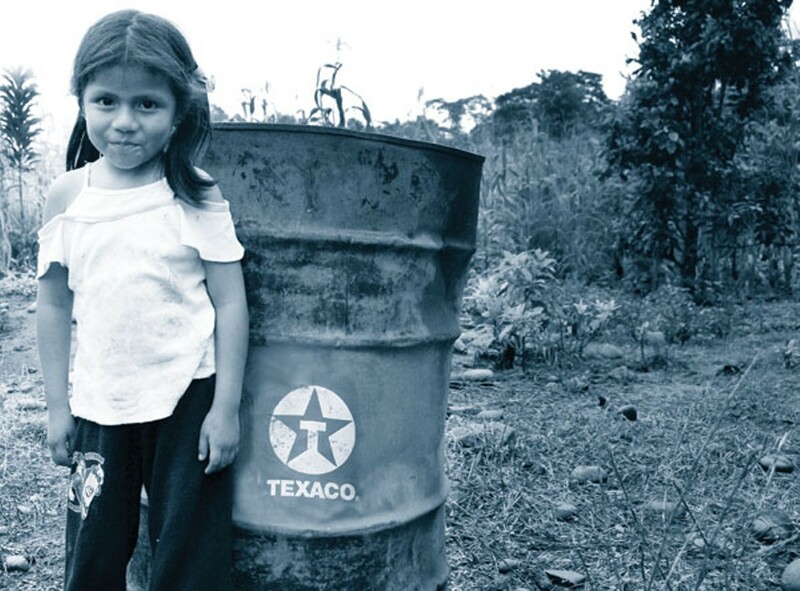 The report, to which more than a dozen activist groups contributed, chronicles environmental and social issues confronting Chevron around the globe. 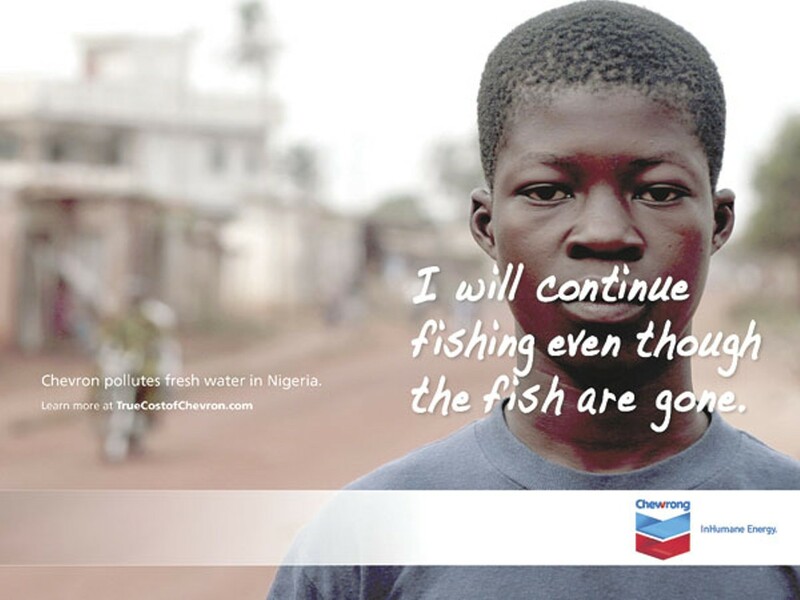 Among other things, it pokes fun at Chevron's "Human Energy" PR campaign. In its billboards and television ads, Chevron paints itself as part of the solution, and implies that the ingenuity of California and its citizens are already solving the challenges that climate change poses to society. One subtext of this advertising campaign is that global warming can be solved by everyday people. 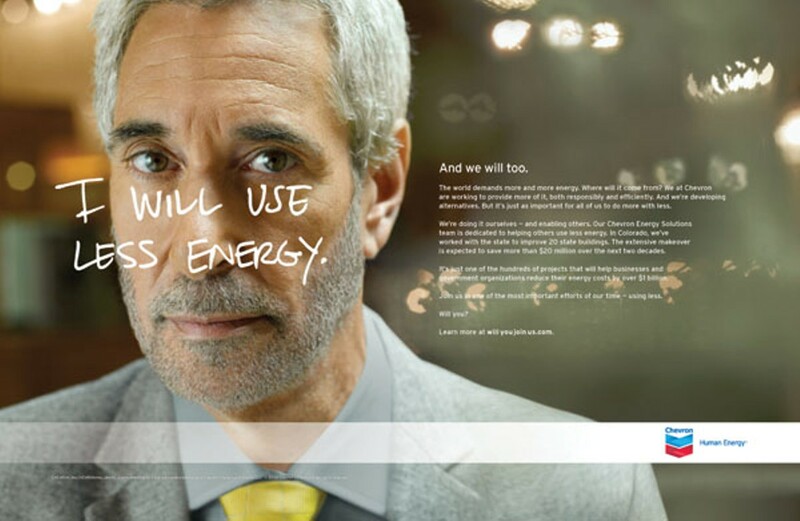 Indeed, the contented Americans depicted in the ads vow "I will use less energy," "I will leave the car at home more," and "I will finally get a programmable thermostat." 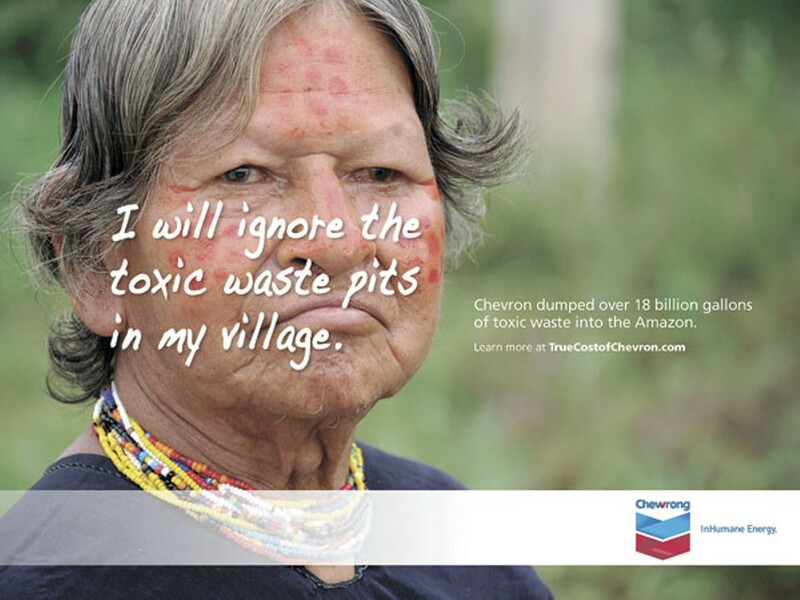 The True Cost of Chevron campaign mocks this notion, by depicting put-upon villagers who stoically vow, "I will not breathe when outside," "I will give my baby contaminated water," and "I will ignore the toxic waste pits in my village." "Chevron is emblematic of an industry that is out of control," Juhasz said. "They are not the worst oil company, but they hold themselves up to be a model corporate citizen, and they don't deserve it." Why then focus exclusively on Chevron? Focusing on one company makes the story more manageable, said Juhasz, exhibiting a clear understanding of modern campaigning techniques. 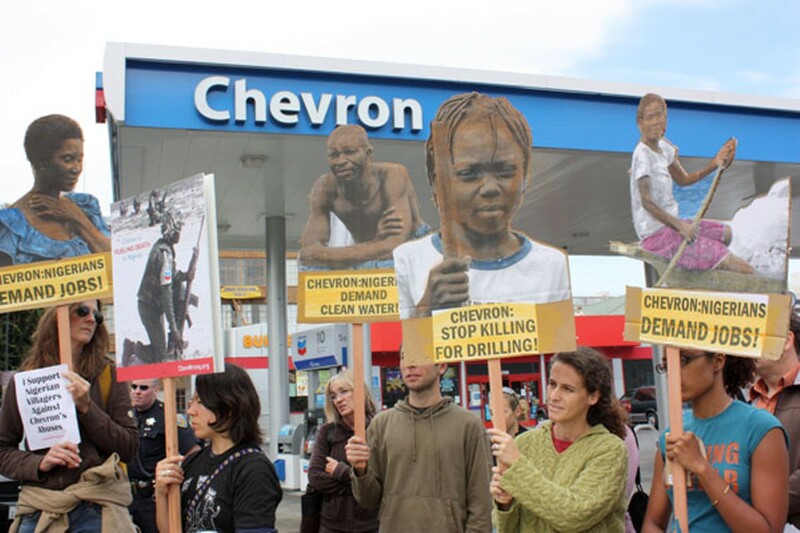 And Chevron is everywhere, she noted, which allows activists to go to gas stations and distribute propaganda, or engage in publicity stunts that take advantage of the company's global profile. "Our issues of peace, democracy, and environmental sustainability overlap with Chevron's actions around the globe," she said. "We want to take a closer look at the local impacts Chevron has globally in order to put pressure on them to be a better corporate citizen here, and everywhere else they operate. Our goal is to build a regional network not so much aimed at Chevron directly, but rather at policymakers who can adopt better regulations governing big oil." While each of the activist organizations involved in this campaign has a different regional focus, they regularly hold conference calls and coordinate strategy to maximize impact. Their common theme is that the issues haunting Chevron in Richmond, Ecuador, Burma, Kazakhstan, and Nigeria are all really the same, and stem from a corporate culture that is out of sync with the values of the Bay Area. 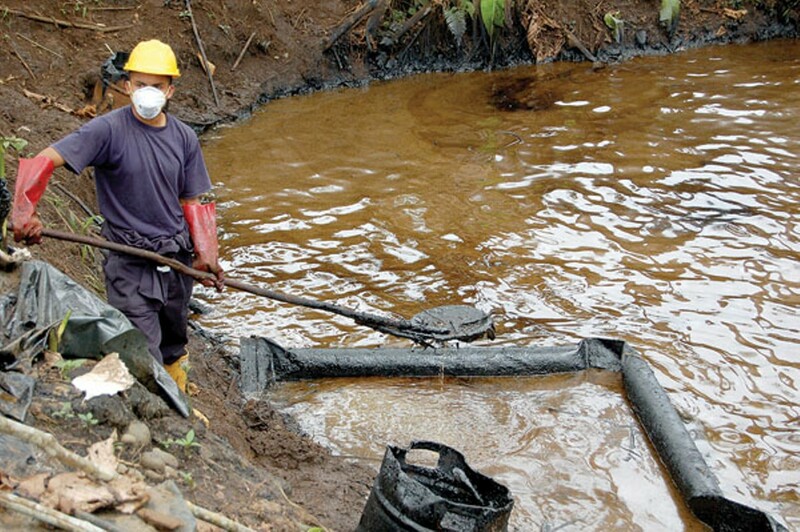 Chevron repeatedly declined to comment on the charges leveled against it by activists. This should come as no surprise since outgoing CEO David O'Reilly suggested at the company's last shareholder meeting that the report pulled together by Global Exchange and various other groups should be thrown in the trash. The company known as Chevron was once part of Standard Oil, which was started by the infamous Rockefeller family, and broken up under the Sherman Antitrust Act. Successor companies of Standard Oil — which once controlled 88 percent of US oil flows — comprised what were known as the "Seven Sisters" and included Exxon, Mobil, BP, Shell, Gulf, Mobil, and Standard Oil of California, which ultimately became Chevron. The sequential subsuming of Gulf (1985), Texaco (2001), and then Unocal (2005) allowed Chevron to become the world's second-largest oil company. Just 36 countries have a larger gross domestic product than Chevron. Based on annual revenues, it is California's largest and the world's fifth-largest corporation, with operations in 122 countries. Chevron was the second-most-profitable US corporation last year, edging out General Electric. The campaign against the oil company can be seen within the context of a larger global examination of what Karin Lissakers, director of the Revenue Watch Institute, calls the "paradox of plenty." Lissakers and others describe this paradox as the persistent inability of resource-rich countries to transform their wealth in oil and other extractive industries into economic development that benefits their citizens. The usually sleepy county assessor's race features a costly tax dispute over Chevron and a financial fight involving the Contra Costa Times.